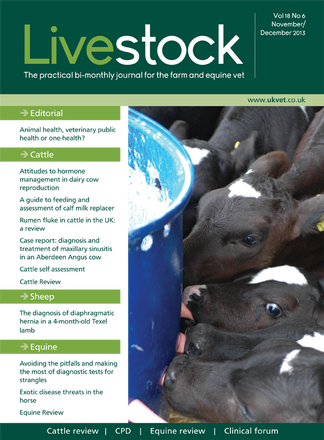 Livestock is the only dedicated, peer-reviewed veterinary livestock journal that covers cattle, sheep, pig and equine. The journal is authoritative and accessible, and offers a comprehensive resource for veterinary practitioners caring for large farmyard animals. Livestock is a must-read publication for livestock practitioners wanting to keep up-to-date with clinical developments that enhance their practice. Livestock provides large animal vets with flexible CPD, which can be carried out at a time that suit you. Be the first person to tell us what you think about Livestock and you'll save £2.50 on your next purchase!